The Big Sky Trailblazers is a group of riders from the Gunnedah and Tamworth area in NW NSW who ride together on the second Sunday of each month and sometimes extend the ride to be a two day ride over a weekend. We are a walk,trot and canter club and kids are welcome. Our rides average around 25 riders and we sometimes have a BBQ lunch as well. We often ride pretty steep areas somewhere along each ride, so bring your brave face along and have some fun; a little challenge feels great, and the horses seem to get into the spirit of things and have fun as well. 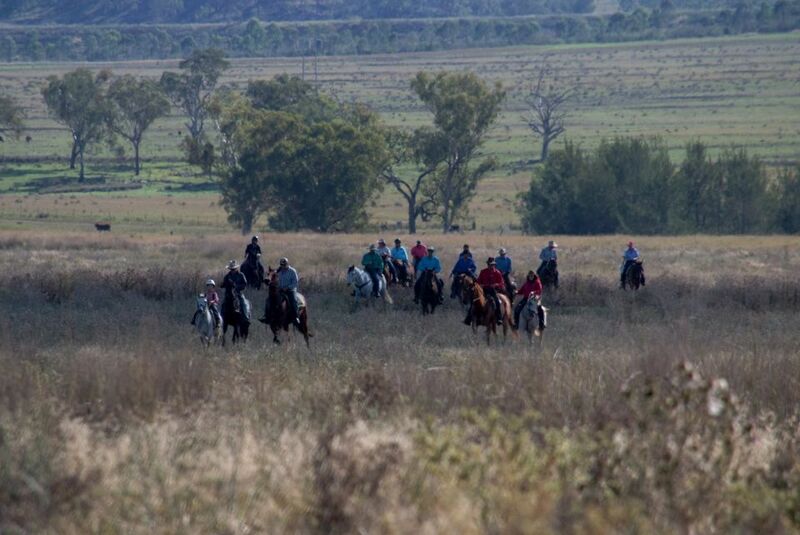 Located near Gunnedah, the Big Sky Trail Blazers is a fun, active club. We have been holding rides on the plains and in the mountains since 2006 and having a great time, even earning our nickname of the Blue Bums after lots of hours in the saddle! The Big Sky Trailblazers was formed in February, 2006 when a group of likeminded people got together to form a trailriding club. We live in the beautiful Big Sky country near Gunnedah and Tamworth, so the name seemed a perfect fit for our great rides in the area. Our nickname of the Blue bums seems to fit well after lots of hours too!! Our first ride was held in March, 2006 , from Duri to Currububula, and we had over 20 riders!! Since then we have had many more rides ranging from rides along the rivers to rides in the New England ranges. We have had really hot rides, and really cold rides (one so cold the pump froze in my horse truck!!) We have an average of about 20 riders each ride and all enjoy a good trot or canter when safe. The BSTB have made up a logo and had t-shirts, jackets and caps printed up for club members. We also have a BBQ lunch available on every ride,and the money we raise from this has allowed the club to buy our own BBQ, walkie talkies, first aid kit and even a transponder for real emergencies. We also donate money to the Wespac helicopter , a gold coin on each ride. Alll in all, we feel the club has grown very nicely and we have a great time each ride!